War in the history books is a punctuated affair. This army met this other army at this location, a battle ensued and there were x number of casualties. One army was the tactical or strategic victor. On this other date this army and that army … you get the picture. We boil down a conflict into events and then study their meaning in the overall fabric of time. As a historian, I add the minutia of daily life and the movements of those armies into the overall understanding of the why, beyond the casualty figures. There are hundreds of events that occurred 151 years ago that colluded to bring us the battle that took place at Pittsburg Landing, Tennessee around a small Methodist Church called Shiloh. Those events involved soldiers and generals and impacted civilians everywhere, not just those who were left in the wake of the passing of the armies to and fro, but those who sent men into those armies. We are approaching several of those anniversaries again, when Confederate General A.S. Johnston abandons Bowling Green, KY and sends 16,000 of his force to Fort Donelson against the approach of a Union army. While this may seem like boring historical minutia, the results of all of these moves bring about one of the war’s largest battles up to that time. February will be a month that sees Johnston pulling back from his positions in Kentucky and the tacit surrendering of Fort Donelson (Feb 15, 1862) and his consolidation of forces at Corinth, Ms.
For the soldiers, the war was daily toil and duty in all weather. Long hours marching in the cold, rain, snow and the inevitable mud that developed on Tennessee, Kentucky, and Mississippi roads. These events produced a camaraderie impacted by privation and common experience. The soldiers attended services on Sundays, some by volunteer and some by regimental edict. Services held in open air or in area churches and all hailed from a common background and many attended services with one another before the war, companies being raised from the same townships. These soldiers had volunteered for war months before and had little idea of what to expect. None expected to be sleeping out in the cold without tents or marching through sleet and the cold of winter, as Johnston’s soldiers did as they retreated to Corinth, or Union soldiers who manned rifle pits and entrenchments in front of Fort Donelson and shivered uncontrollably with nothing to protect them from the biting wind. War was adventure when they volunteered, when both sides figured that victory was one battle away. Those battles came and went and the armies grew in number. These actions happening in February 151 years ago allow one army to take advantage of the ill preparedness of another, launching an attack that ultimately ends in a casualty list that dwarfs anything that had yet been suffered. These soldiers, these men of all ages who gave up family and comfort to do something for a common cause, they stepped into a maelstrom on April 6-7, 1862 that made widows and orphans of thousands of the family left behind and filled the graves of thousands who now rest in peace along the bluff above Pittsburg Landing, Tennessee. 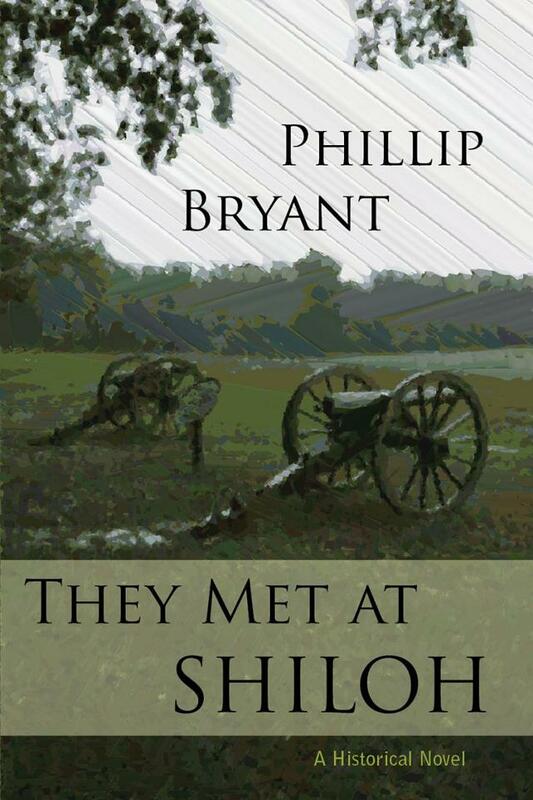 I wrote my first novel, They Met at Shiloh as a means of exploring the human part of any battle, the soldiers. The war for them was more than just a tactical movement or a march from here to there. It was a daily experience molded by military discipline. That there were battles occasionally was just the culmination of all those marches and uncomfortable days and nights. As one reviewer has pointed out, she felt like she was listening to someone who had actually been there. That was the reason I wrote it, to give voice to the common soldiery of the time. Phillip M. Bryant attended the University of New Mexico and earned his bachelor’s degree in history and with a minor in American studies. He has been active in local New Mexico reenacting and on the national level is a member of the 23rd SNY as part of the Army of the Pacific, 1st Federal Division. He has been researching the American Civil War for over 25 years. His sources have included diary accounts, autobiographies, historical monographs and first-hand reports on the actions taken 150 ago published in the War of the Rebellion battle reports and War Department communications. Forced to leave his position as minister, Phillip Pearson knows his life is in danger, but not just from the Confederates. The Harper family, incensed at Pearson’s refusal to bury a philandering son, has a vendetta against him that is played out on the battlefield.